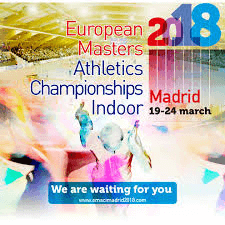 The historic city of Madrid and Real Federación Española de Athletismo hosted an excellent Indoor Championships in the Gallur Sports Centre from 19-24 March, the third time the Spanish Masters have organised these Championships.What the record 3,832 competitors from 40 European Affiliates, plus eight from non-European countries, did not expect to experience in sunny Spain was freezing weather, minus 2° at night, icy circles for the outdoor throwing events and heavy rain. Adverse weather does not stop the Masters from competing, and the Organising Committee are to be congratulated for the smooth running of the heavy schedule. Ukrainian Oleg Fedorko raised his own M60 high jump record, 1.74m that he set in Daegu when taking the WMA Indoor title last year, to 1.78m here. Wolfgang Ritte, Germany, had broken his own M65 World pole vault record in Potsdam earlier this year clearing 3.95m; here he upped to 3.96m. This prolific World Champion still holds the M45 World Record (4.77) from 1999, M55 (4.51) and M60 (4.16). The host nation also got a WR when M50 Jose Antonio Urena Vano notched up 4415pts in the Pentathlon. Rolf Geese’s M70 4568pts from Budapest in 2014 was raised to 4575pts by Valdis Cela, Latvia. Klemens Grissmer from Germany cleared 11.93m for a new M65 triple jump record. W35 Silva Vania of Portugal Weight Throw of 18.45 was remarkable considering the cold weather. The previous mark was set in October 2016 during the WMA Championships in Perth by Byrony Glass. Petra Bajeat, France, set two new marks in the W50 long jump, clearing 5.53m and in the high jump 1.58m. Britain’s Wendy Laing, making a welcome return to international competition and now in the W55 age group, may have lost her W50 World record to Bajeat but she quickly wrote herself back into the record book clearing 1.55m, having jumped 1.50m last month. Guenter Ciesielski, of Germany recorded 25.49.51sec. in the M90 3000m track walk, Britain’s W60 4 x 200m team of Helen Godsell, Carole Filer, Jane Horder and Caroline Powell broke their own World Record (2.02.39) set in Torun two years ago, clocking 2.00.37sec. Star of the Championships however was prolific record breaker Angela Copson from Great Britain. Awarded her European Best Masters Athlete of the Year Trophy during the Opening Ceremony by EMA President, Kurt Kaschke, she went on to win the W70 3000m in 12.49.26sec, a Championship Record, on the first day. She has a 12.37.45sec yet to be ratified World Record from the British Masters Championships on 11 March. 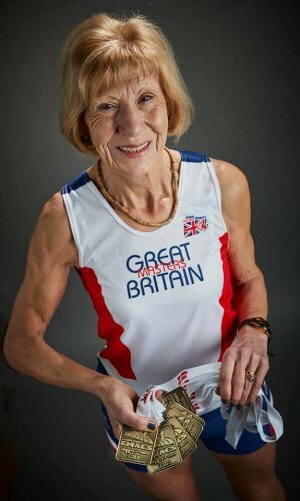 She is the first woman aged over 70 to run the distance twice in under 12.50.00sec. On Day 4 she won the 800m in 3.00.67sec, a Championships Record. Again she has a 2.58.03sec World Record awaiting ratification from an Indoor Meet in London on 4 March. At 09.20 on Day 5 she added the 1500m to her tally and won the individual 5km cross-country race and team title on the following day. She now holds the W70 800/1500/3000m World Records simultaneously as she ran the 1500m in 5.49.12sec on the first day of the British Masters Championships on 10 March.